My earliest food memories are absolutely at home. And they totally revolve around cake. Cake was one of those early cooking lessons where a kid could help out without running too much of the risk of getting injured. Odds are I probably made a mess, but it beats playing with the stove. So cake was one of those things that was always around the house. Not that we ate them all. Nope, much of this was for sharing. Now, we kept things simple in our household. Boxed cake mix was the way to go. I’m pretty sure my mom (or a lot of people’s Mom’s) were the Cake Doctor before that was a cookbook series. 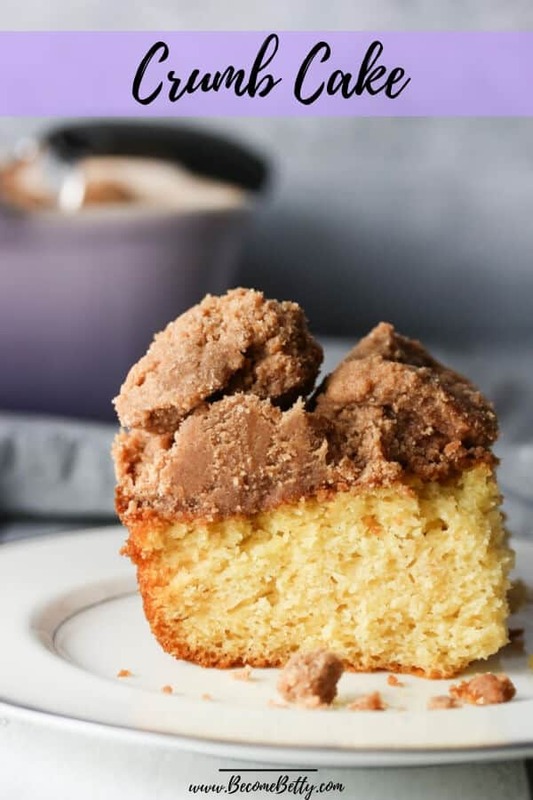 This recipe utilizes 1 box of yellow cake mix with a delicious cinnamon crumb topping. In fact, this recipe was given to my Mom from my Godmother. So the origins of this recipe might require a 23 and Me Test to figure out. However, I do assure you this is from a now thoroughly aged and well-loved page from her cookbook. So, no disrespect to bakers out there who love cake from scratch. But there is something so unusually delicious about boxed cake mix that can’t be replicated at home. 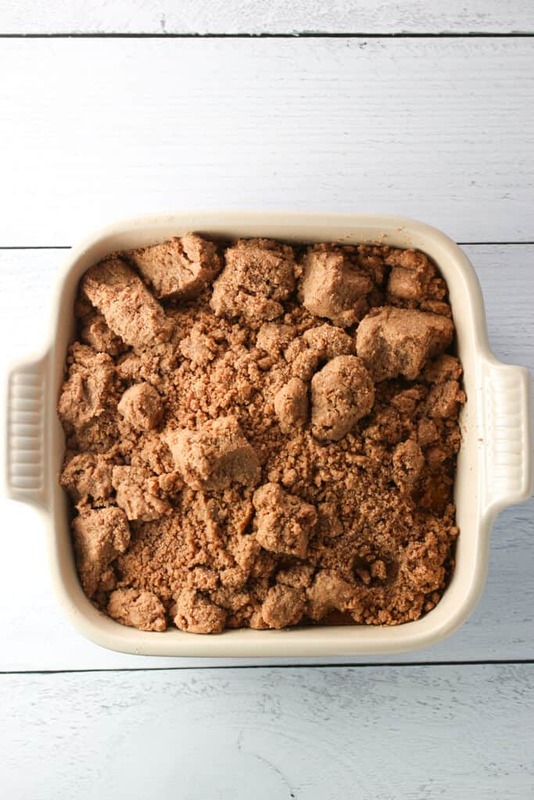 Find a boxed mix you like and this is a great modification. 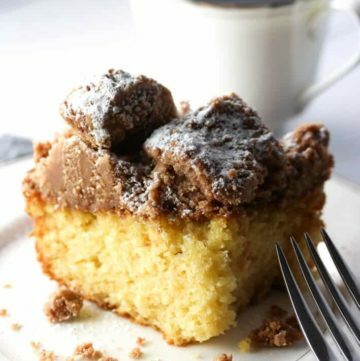 What’s the difference between Coffee Cake and Crumb Cake? 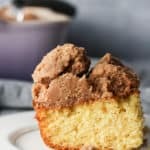 So there are certain words and phrases that seem to be used interchangeably like stock and broth, frosting and icing, and somehow coffee cake and crumb cake. 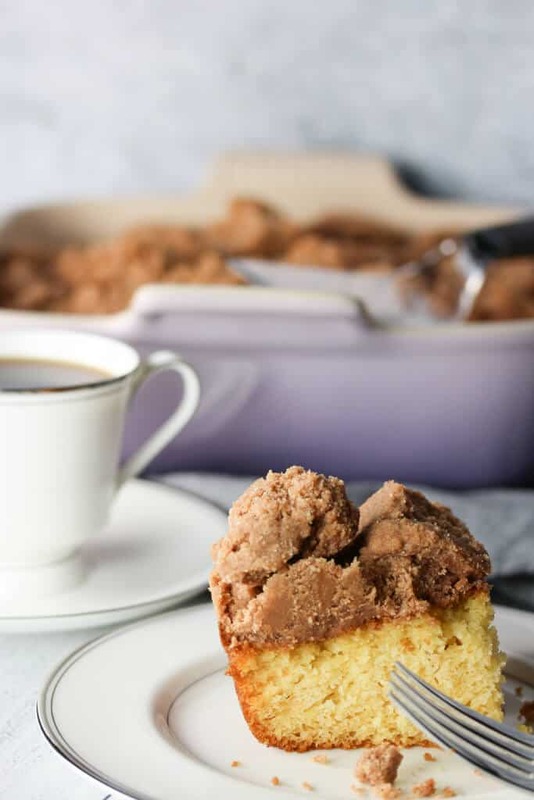 A coffee cake can refer to anything that is meant to be enjoyed with coffee. It may have a crumb topping, streussel topping, or no topping at all. 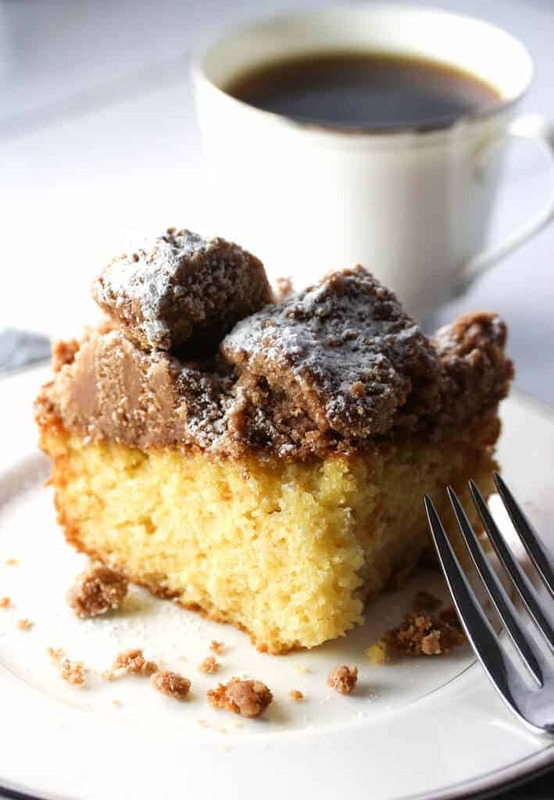 A crumb cake specifically refers to a cake with crumbs. Lots of them. There is also a bit of dialect involved here as well. 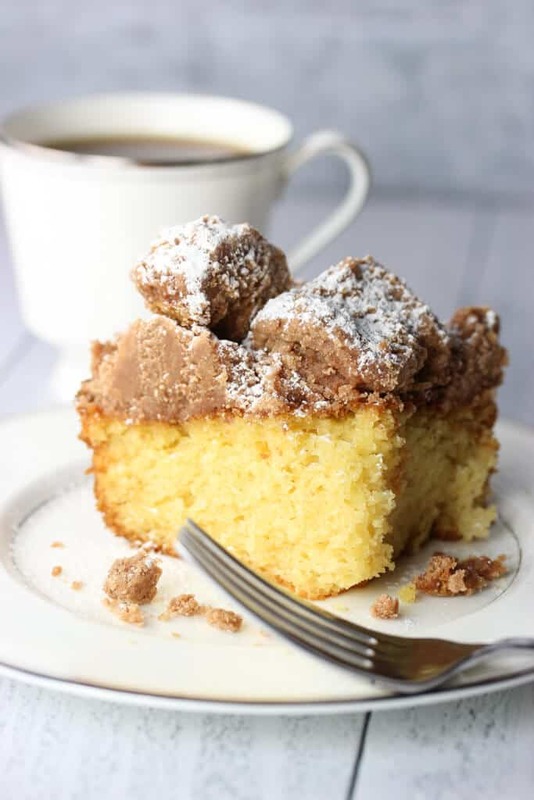 For example, if you are in New York (like me) and ask for coffee cake then expect a slice of crumb cake, which has just about as much crumbs as cake. In this region, we are referring to the same thing. However, the NY Times put up a great linguistic quiz to show how much language varies. While crumb cake isn’t on the list, items like Pop or Soda do make the list. As a home cook and blogger, a recipe should be a starting point. I believe that your taste buds are different from mine. So here is my completely incomplete list of pairings that should work if you wish to modify the original recipe. Here at Become Betty, one of my main objectives was always to inspire you, the reader, to be more creative in the kitchen. Consider these my Betty Twist, an easy and inspiring list to help you get more daring and creative. These flavor suggestions all pair well with either cake or the crumb topping. If you wish to modify the cake you could easily add in apple, banana, blueberry, cherries, cranberries, lemon or orange peel, peach, and strawberries or nuts. With any fresh fruit, be sure to store in the refrigerator after cooling from the oven. If you wish to modify the topping you can easily add or switch out the cinnamon with cardamom, gloves, ginger, mace, nutmeg, cloves. Those spices all vary in potency. So you’ll want to only add a little bit to make sure it doesn’t overpower the rest of the cake. Start with substituting 1/2 tsp of the cinnamon for a different spice as a starting point. If you with to add a glaze on top of the decadent topping then consider amaretto, brandy, cognac, kirsch, Grand Marnier, a berry or orange liqueur. Use 1/4 cup of 10x sugar with 1 tbsp of the liqueur. Taste before adding. If it is too strong add a very small amount of water to thin it out. And yes, powdered sugar adds a beautiful layer of sweetness as well. Boxed cake mixes yield reliable results, but please avoid the boxes that use butter in the mix. If you don’t like as many crumbs as you see here, the recipe can easily be cut in half. If you feel fancy or want to make an even better presentation sprinkle to stop with some 10x sugar or make a glaze to drizzle on top. Step 1: Preheat oven. Make cake according to instructions on box. Step 2: In a food processor combine flour, butter, sugar, vanilla, and cinnamon. 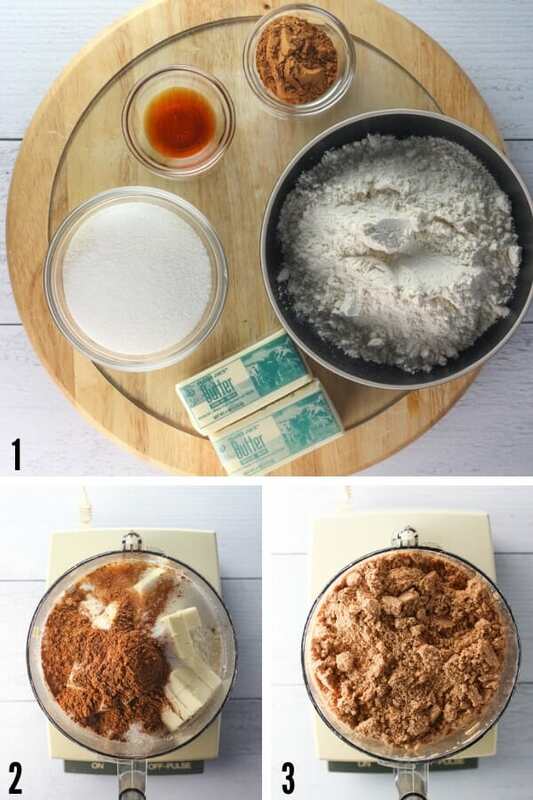 Combine until a crumb topping forms. Step 3: Wait for cake to be cooked through. Add to the top of the hot cake and return to oven for 10-12 minutes. Step 5: (Optional) If you want yours to look extra fancy, add a dusting of powdered sugar to the top. Slice, share, enjoy! If you’ve tried this Crumb Cake or any other recipe on the blog, I’d love the hear what you thought about it in the comments below. I love hearing from you! You can also FOLLOW ME on Facebook, Instagram, Twitter, and Pinterest to see what I’m up to. This moist and super rich layer of crumbs is a decadent breakfast or dessert with the spice of cinnamon. This recipe is super easy and simple to make. 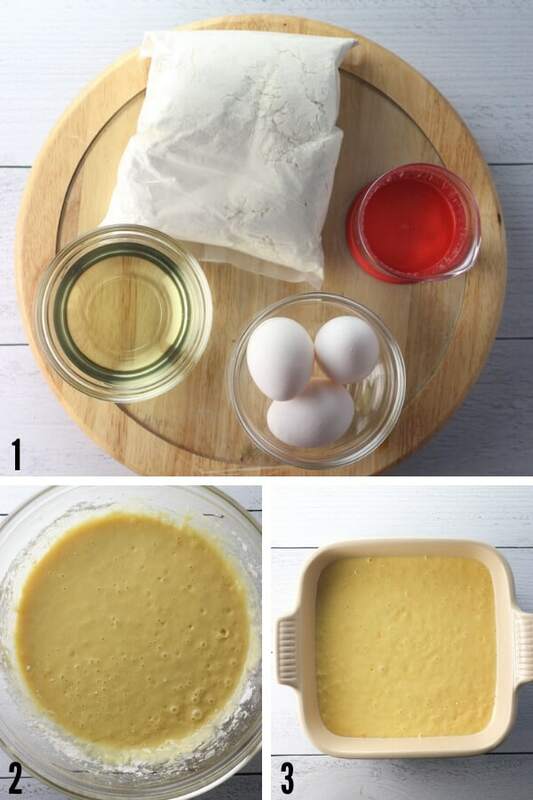 Make your favorite yellow cake mix according to the directions on the box. Bake as per the directions on the box. While waiting for cake to cook, combine flour, butter, sugar, vanilla, and cinnamon in a food processor. Pulse until begins to look like crumbs. When cake is fully cooked, add crumbs to the top of the cake and return to oven and bake for 10-12 minutes. Slice and enjoy! This is great recipe to bring to a gathering or any place where it will be shared. Optional 10x sugar can be dusted on before serving. You'll still need to add the ingredients needed to make the cake. Calorie count only takes the crumb mixture + boxed cake mix into account. If you don't like as many crumbs as you see here, the recipe can easily be cut in half. Love crumb cake! I think I’ll just do crumbs alone then mix with cake batter ice cream. The crumbs are where the magic happens to be. If you just bake up the crumbs from this recipe and they are still warm from the oven they would be delicious with ice cream! Looks fabulous with a cup of coffee or tea!! Hey Bernice! Thanks so much! I needed an excuse to turn the oven on in this cold weather. This recipe pairs really well with coffee or tea. Thanks so much for stopping by! Oh yes, the cold weather! Good time for baking and comfort food! Wow- wow this crumb cake looks beautiful. Thanks so much for the recipe. Hey Dag! Thanks so much!